The Etihad First Apartment space is very comfortable because the bed is comfortable, similar to my bed at home. The temperature is just right, not too hot or too cold. I liked sitting in seat 4K because it's by the window and faces forward. My mom's seat, 3K, faced backward. It's neat that half of the wall between our seats could come down, so that when our beds were made the pillows were right next to each other. The food was good. 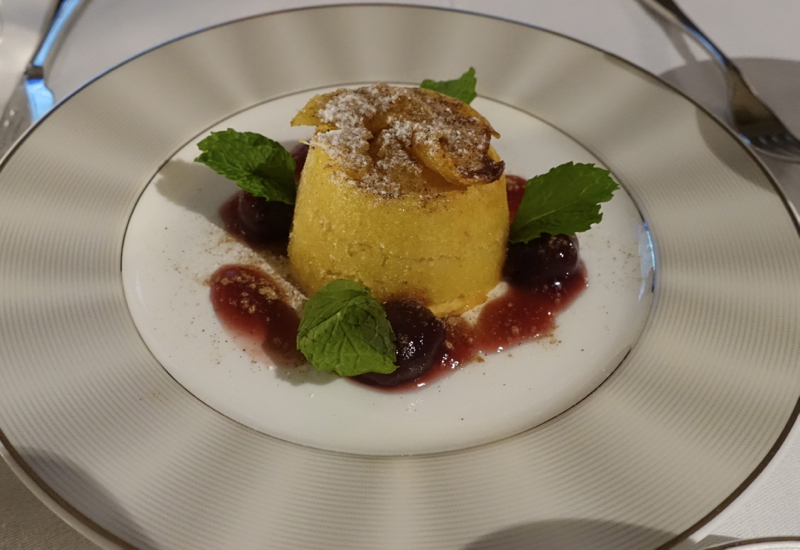 The best part was the apple marzipan dessert because it had cherries, my favorite fruit, along with this yummy cake with almond and apple flavors. 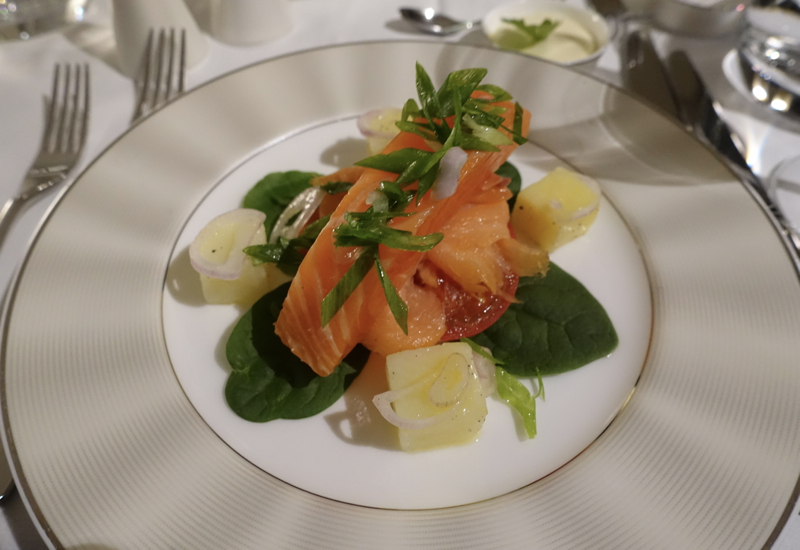 I also liked the salmon appetizer with the creme fraiche dip, which made the salmon and salad even yummier. I didn't like the tomatoes and onions, because I never like tomatoes and onions. 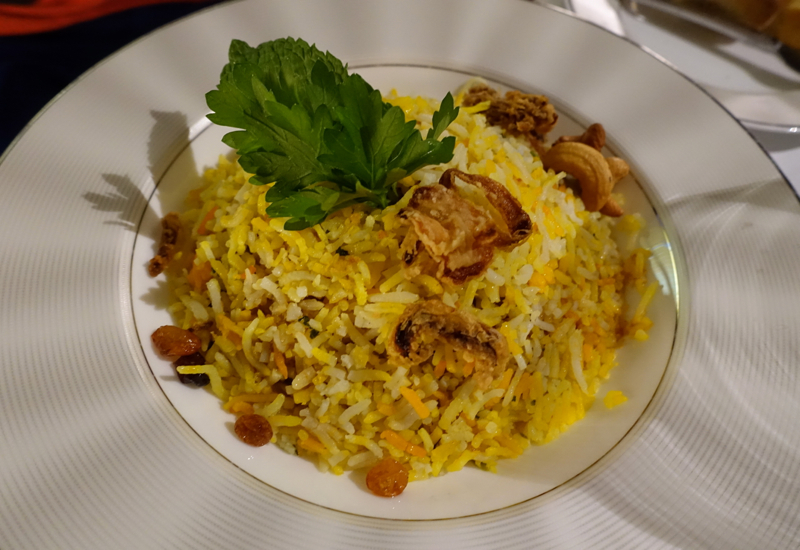 The lamb and rice dish was good too, except there was too much of it, so I was only able to eat about one third of it. The lamb and the rice were delicious alone and together. The entertainment system was pretty good, there was even a kids section, where I liked watching Mickey Mouse, which was pretty funny. 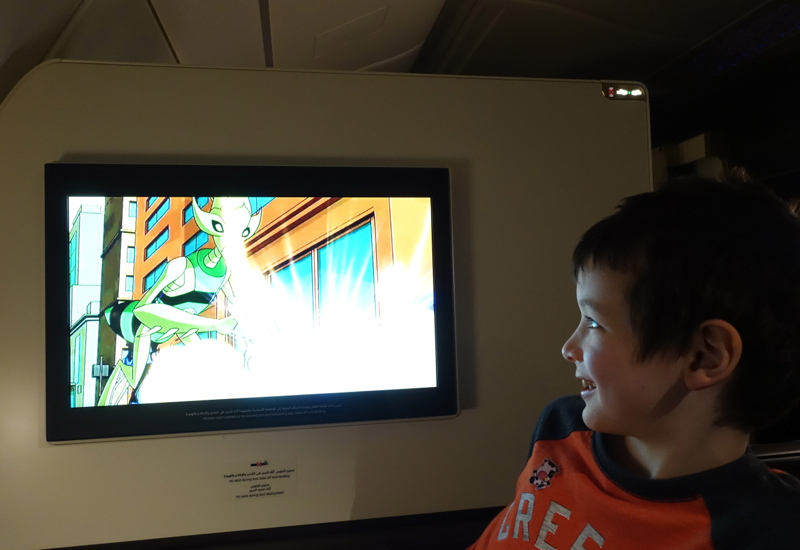 I also watched Ben 10: Omniverse, which is about a boy who wears green every day, who can change into all kinds of animals and whenever he changes into an animal, it's all green. I liked that, since green is my favorite color. Doc Mcstuffins is a doctor to all her stuffed animals and she treats them whenever they get hurt. I really liked that it was funny and that all the stuffed animals are alive. I wish some of my stuffed animals would come alive like that. 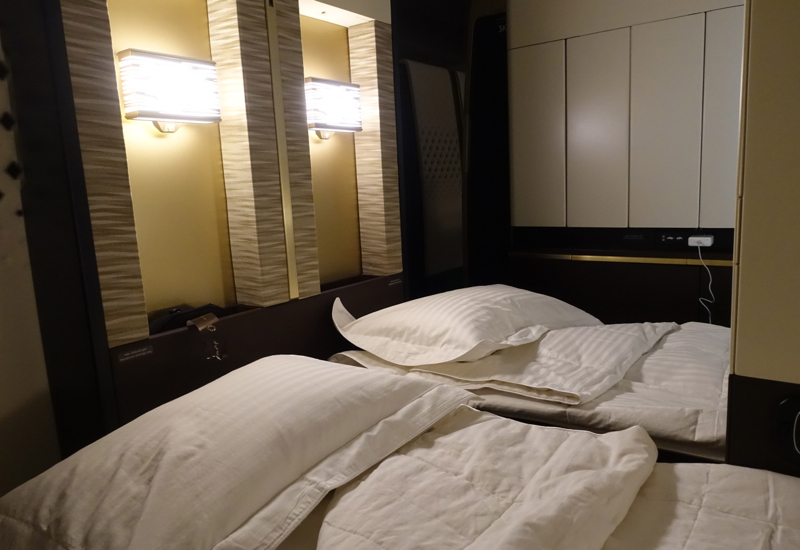 I like Etihad First Class Apartment as much as Singapore Suites–to me, they're about equal. Both are really comfortable and have doors that close, even though the Etihad First Class Apartment does have more space. 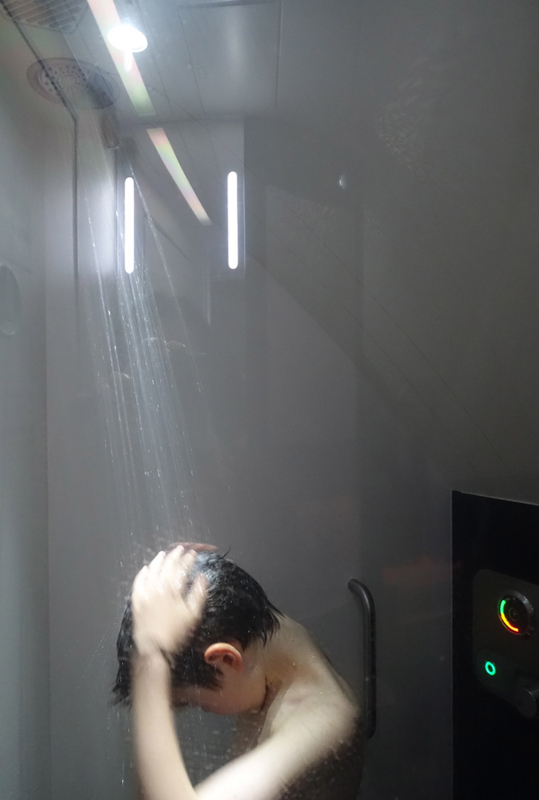 It's also really cool that there's a shower on the plane! I was sneezing and coughing a lot because of the dry air, and taking a shower helped me feel better. There was shampoo, conditioner and bath gel, and I got to see how much time I had left with the dial, which went from green to yellow to red. 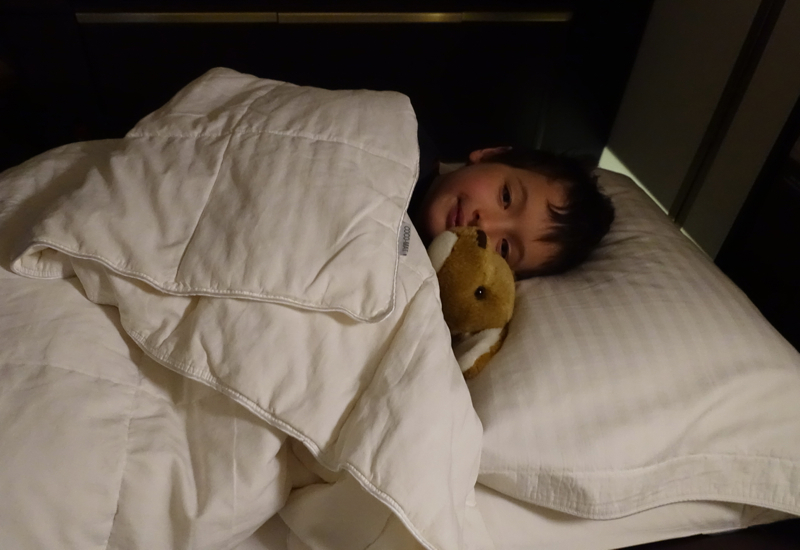 I didn't like sleeping even though it was healthy for me because it was boring, but I did get to sleep with my pet stuffed animal Kanga (short for kangaroo) and its baby, inside its pouch. I really liked that my mom and I got to read bedtime stories together because the wall slid down, so it was like reading a story at home in my bed. We are reading George and the Unbreakable Code by Lucy and Stephen Hawking. The people are very nice. Whenever I'm watching something with my headphones, I take them off when they come in to ask me if I need anything. On my other Etihad First Apartment flight from Sydney to Abu Dhabi, one of the flight crew who is Ukrainian but is a native Russian speaker even helped me with some of the words in my Russian homework that I didn't understand, which was really great. 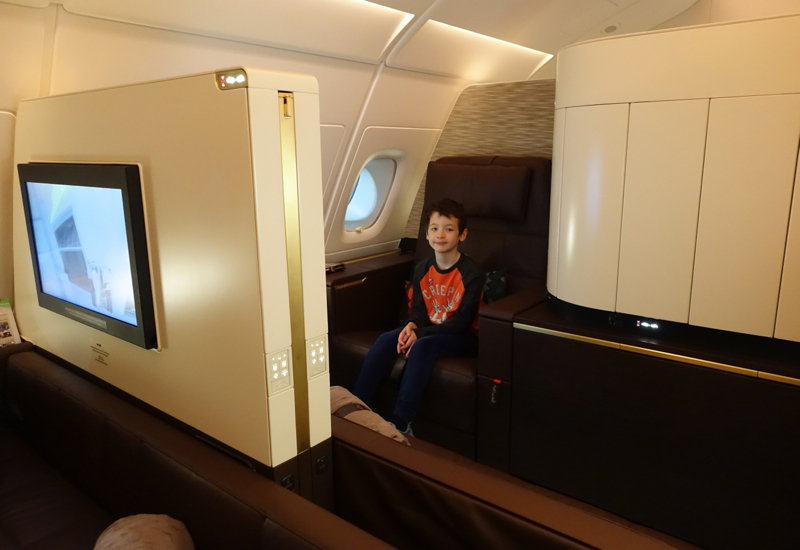 Have you flown in an Etihad First Class Apartment as a kid (or as a parent with a kid)?